Not a goodfairy two shoes? Get inspired by a Queen of Darkness! Do you hate cuddly puppies and smiling babies? Do happy endings make you want to barf? What kind of twisted monster ARE you? No panic: the Evil Queen will help you work it out! She’s been banished to a mirror prison for overstepping the limits of her story. Now she has a LOT of time on her hands. Plotting wicked deeds and remembering the bad old days can only fill so many hours. So she’s writing this diary to twist your innocent mind. Find out how she does it – and how you can do it too! Being bad has never felt so good. OMG, just by looking at that picture i am totally dying to read this. Can’t Wait!!! 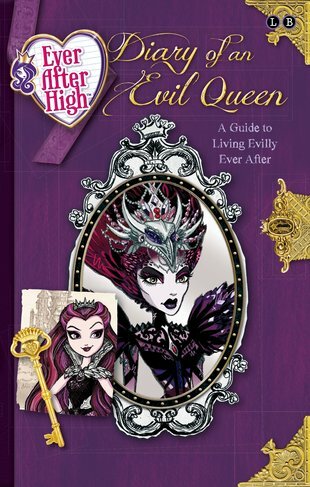 I think this book will be quite entertaining because I have been watching the Ever After high Tv series ad find it quite entertaining, keeping you on the edge of your set wanting more. Explaining that you don’t have to follow in the path others want you too, but in a way you want to for better or for worse – deciding what would make you happy.